There are two basic types of employees in the workplace – “exempt employees” and “non-exempt employees.” What’s the difference between these types of workers and the jobs they hold? The most significant difference is pay for overtime work. The term “exempt” means exempt from being paid overtime. There are regulations which govern whether an employee could be exempt from receiving overtime pay. Certain types of employees, often classified as exempt employees, are not entitled to overtime pay as guaranteed by the Fair Labor Standards Act (FLSA). To add to that, most states have their own wage and hourly rate laws that have even more requirements in addition to the FLSA. The FLSA requires that employers must pay at least minimum wage for up to 40 hours in a work week and overtime pay for any additional time unless the employee falls into an exception category. In addition to the Federal Act, many states have their own set of wage requirements and laws and it is imperative that employers abide by both federal and state law to stay compliant. If an employee is considered exempt (vs. non-exempt), their employer is not required to pay them overtime pay. It is at the employer’s discretion whether or not to pay for hours worked overtime. Some employers might create an employee benefits package with extra perks in lieu of overtime pay. In general, to be considered an “exempt” employee, you must be paid a salary (not hourly) and must perform executive, administrative or professional duties. To complicate matters further for employers, there are additional federal, state, and FLSA laws related to other classifications of workers, such as interns, independent contractors, temporary employees, volunteers, workers in training, and foreign workers, that employers are required to abide by. A non-exempt employee is entitled to overtime pay through the Fair Labor Standards Act (FLSA). Also, some states have expanded overtime pay guidelines. Check with your state Department of Labor website for rules in your location. Employers are required to pay time and a half the employee’s regular rate of pay when they work more than 40 hours in a given pay week. Most employees must be paid the federal minimum wage ($7.25 in 2019) for regular time and at least time and a half for any hours worked over the standard 40. These categories are purposefully broad to encompass many types of jobs. It is the tasks performed on the job, not the job title alone, which determine exempt vs. non-exempt employment status. The FLSA guarantees non-exempt employees one and one-half times their normal pay rate for overtime worked during a given work period. Employees are paid a salary as opposed to being paid on an hourly basis. Employees earn at least $455 per week. Employees are paid a salary for any week they work. For the administrative exemption, employees must have a primary duty of performing office or non-manual work directly related to the management or general business operations of the employer or the employer's customers, and their primary duty must include the exercise of discretion and independent judgment with respect to matters of significance. For a professional exemption, employees must have a primary duty of work requiring knowledge of an advanced type in a field of science or learning customarily acquired by prolonged, specialized, intellectual instruction and study, or must specialize in a few other similarly, highly specialized fields, such as teaching, computer analytics, and engineering. In general, non-exempt employees earning less than $455 per week, which is $23,660 per year, are guaranteed overtime pay. Some exceptions to this include researchers or those working under an educational or governmental grant. Susan is an exempt employee, therefore not entitled to overtime pay. John is a non-exempt employee, so he works as many overtime hours as he can because he earns one and a half times his hourly wage. Bethany earns $400 per week, so she is guaranteed to earn overtime for her extra hours at the office. After her promotion and salary increase, Reshma was no longer a non-exempt employee eligible for overtime pay. Rob took the first of two job offers despite the lower salary because he would be eligible for overtime pay. Not all states have the same guidelines for exempt employees. For example, in California to classify an individual as exempt from overtime requirements, large employers must pay the worker at least $49,920. For small employers, the amount is $45,760. All other employees would automatically be eligible for overtime regardless of job responsibilities. 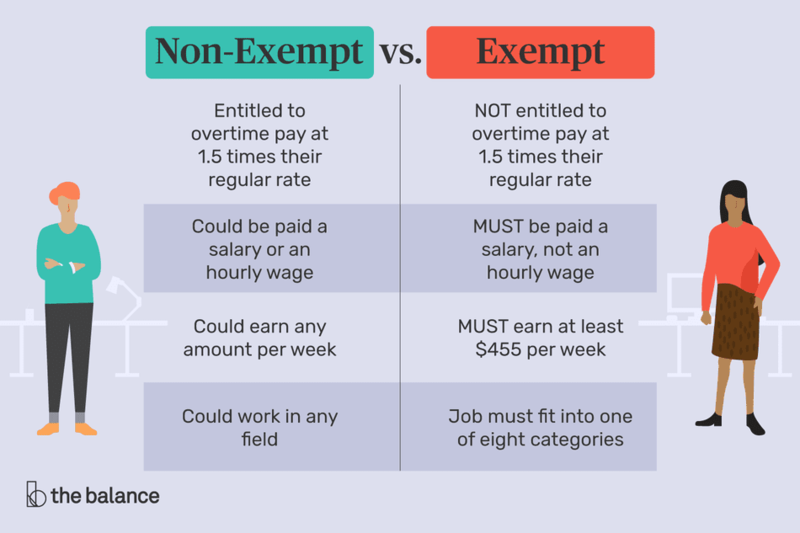 Workers earning over the salary threshold would still need to meet the other criteria for exempt status to be placed on that category. Also, non-exempt employees must be paid overtime wages equivalent to at least 1.5 times the California minimum wage of $12 per hour (for employers with over 26 employees) or $18.50 per hour. In New York, the 2019 NYS salary thresholds vary by location. New York City has a seperate threshold for small and large employers. Nassau, Suffolk, and Westchester counties also have a different threshold than the remainder of New York State. Check with for your State Department of Labor for the latest overtime provisions in your area.